Backing up, reversing into parking spaces, and parallel parking may not result in as many deaths and serious injuries as high-speed driving, but these low-speed driving situations do account for a significant chunk of all accidents. The main reason that backing up results in so many accidents is that cars and trucks have blind spots that make it difficult to see pedestrians, cars, and other objects. There are a number of ways to help eliminate those blind spots, but back up cameras and parking sensors are two of the most common. Blind spot mirrors can be helpful when backing up, but a well-placed camera can effectively eliminate blind spots. These cameras are also easier to use since the video display is often located in the dash. That's especially helpful for people who have limited mobility, which can make it difficult for them to physically turn around to check blind spots. Most blind spot cameras use fisheye lenses, which allow them to provide a very wide angle view of whatever is behind a vehicle by causing a type of barrel lens distortion. Fisheye lenses aren't very good at picking up distant objects, but that's not an issue for purpose-built backup cameras. Some blind spot cameras also have a built-in light or a night vision function so they can be used in the dark. Parking sensors perform the same function that back up cameras do, but they don't provide any visual information. Instead, they're designed to alert the driver if there are any obstacles in the way. If a child or animal walks behind the vehicle when it is backing up, this type of sensor can trigger an alarm that will allow the driver to stop in time. Some parking sensors are also integrated into automated parking systems. These sensors provide data to a computer that is then capable of calculating the proper steering angles and acceleration needed to park. Parking assist systems then tell the driver when and how much to turn, while fully automated systems can actually park the vehicle. Back up cameras and parking sensors are available as both original equipment and from the aftermarket. 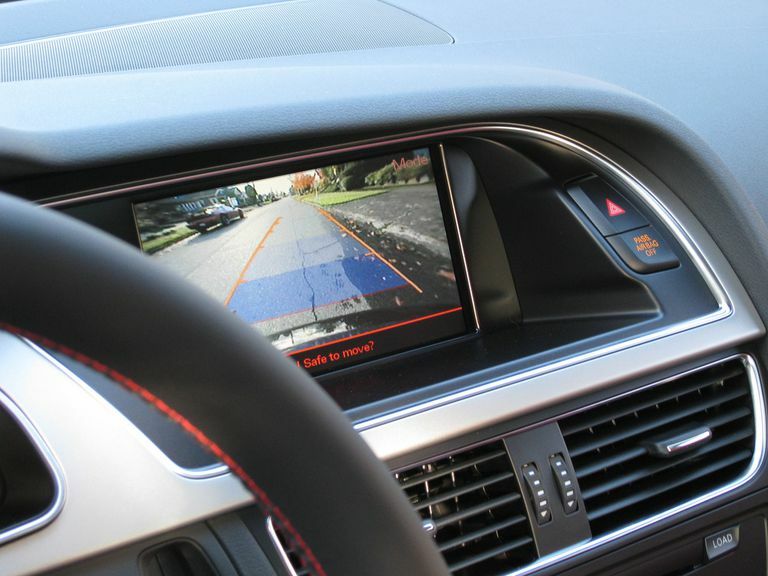 Original equipment back-up cameras are typically integrated into infotainment systems since most infotainment and navigation systems have built-in full-color LCD displays. Some vehicles are wired for back up cameras or parking sensors even though they didn't actually come with that option. In those cases, it's typically possible to install either aftermarket or OEM parts without too much effort. There are a number of aftermarket options available for cars and trucks that didn't come from the factory with a backup camera. Some aftermarket suppliers also offer parking sensors, but there usually isn't any price or labor advantage to installing sensors instead of a camera. Most aftermarket rearview cameras are mounted to the license plate, but some can be attached to the bumper or elsewhere. There are also both wireless and wired options, though wired cameras typically provide a better quality picture with less chance for lag or interference. Wireless back up cameras often come with LCDs that feature built-in receivers, but the video feed from a wired camera can be displayed in a number of different ways. Some infotainment systems have auxiliary video inputs that a backup camera can be plugged into, and so do many video head units. If that isn't an option, any LCD that's small enough to mount on the dash will typically work.